Okay, it’s ready. It’s out next Monday. The proofing has been done (I’ve just got to fix my errors then get them rechecked). Detective Constable Scott Cullen’s professional and private lives are at opposite ends of the spectrum. His career is impacted by the jockeying for position ahead of the formation of the Scottish Police Service, as much as by his own inability to push his case for promotion. Meanwhile, his relationship with DS Sharon McNeill goes from strength-to-strength – dinner with both sets of parents is interrupted by a call to action. And it’s coming out next Monday on Amazon Kindle with others to follow soon. It’s a doozer – the best Cullen so far, I think, and backed up by the lucky few that have read it. It’s the culmination of the first trilogy (in four parts, natch) and will be the last SOMETHING IN THE SOMETHING book – Cullen five (hopefully out before Xmas) will be called BOTTLENECK (or maybe BOTTLE NECK, who knows?). As you’ll have seen, it’s had the most copious editing (rather than the rush job that I did on FIRE IN THE BLOOD) and I’m feeling seriously good about it. After this, it’s on to finishing SHOT THROUGH THE HEART (plus I’ll do a tweak to DEVIL, like I did with GHOST but much less drastic). August feels attainable. Oh, if you’re on the mailing list – you’ve got an exclusive removed chapter from this coming your way. Otherwise, get on the mailing list! 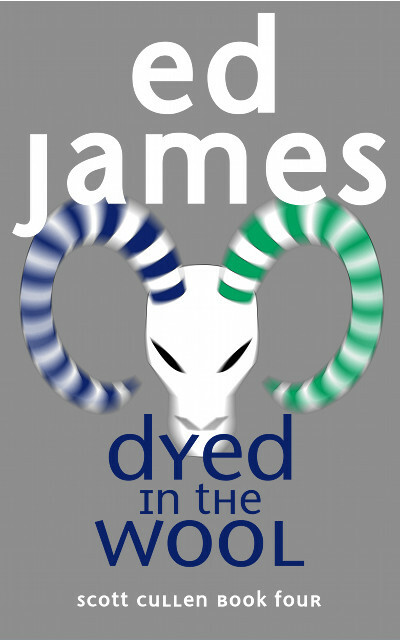 Next DYED IN THE WOOL out now! Good gods, man. I read too fast and thought the last something in the something meant the end of the Cullen books altogether. Squueeeee, can you tell I am antsy waiting for the 8th? I aim to, even if (when) it breaks me…!